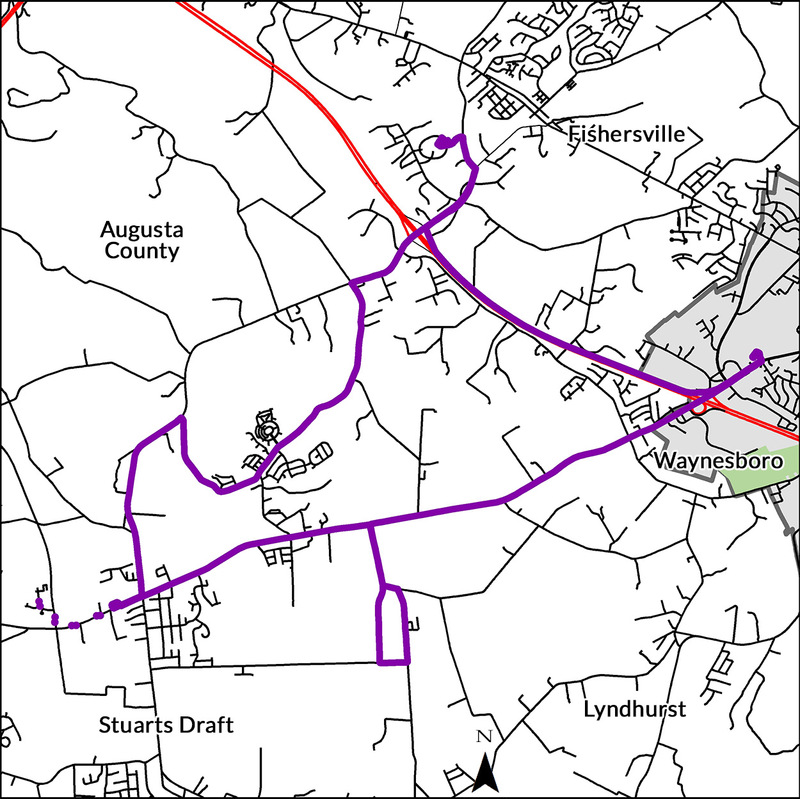 The map above is represented by the cities and counties of Fishersville, Augusta County, Stuarts Draft, Waynesboro, and Lyndhurst. Stuarts Draft Connector, Monday – Friday: 6:50 a.m. – 4:43 p.m.
Two Hour Mid-Day Break: 10:43 a.m. – 12:50 p.m. The Stuarts Draft Link does not operate between 10:43 a.m. and 12:50 p.m. Monday through Friday. Consistent Schedules Link Stuarts Draft, Fishersville, And Waynesboro. Our Stuarts Draft Link provides bus service within Stuarts Draft and connections with Fishersville and Waynesboro. Our routine service runs Monday through Friday from 6:50 a.m. to 4:43 p.m., with a two-hour midday break between 10:50 a.m. and 12:50 p.m., and is perfect for the commuter traveling to work, medical appointments and shopping. Stops include, but are not limited to: Stuarts Draft residential areas, Augusta Health Stuarts Draft, Target Distribution Center, Stuarts Draft Retirement Community, Walmart, and Augusta Health Campus. Enjoy Safe Rides On Clean Buses. Our team takes great pride in our customer service and bus safety. Our drivers are trained in defensive driving techniques and in loading and unloading mobility devices safely. Our mechanics keep the engines in our buses running smoothly and the interior and exterior of our buses pristine. We provide safe riding tips to get you easily accessible information so you feel comfortable riding with us. When you travel with BRITE we build relationships with you to enhance your experience and our community. Ride The Stuarts Draft Link!